Reference: Gabriel Kolko, ‘Ravaging the Poor: IMF Indicted by Its Own Data’, Multinational Monitor, June, 1998, p21. In fact many the nations following the World Bank/IMF prescriptions did not prosper: ‘the majority of those nations that have followed the IMF’s advice have experienced profound economic crises: low or even declining growth, much larger foreign debts and the stagnation that perpetuates systemic poverty.’ Some countries that had declined the IMF’s ‘enhanced structural adjustment’ loans were in contrast better off. Reference: Davison Budhoo and Claude Alvares, ‘Why the IMF Is a Threat to the South’, Third World Resurgence, June, 1992. Davison Budhoo, a former IMF economist who quit in disgust over IMF policies, argues that loan conditions were not imposed to meet the economic needs of the borrowing countries but were rather aimed at satisfying the economic and social needs of developed capitalist economies. He is one of many current and former employees of the World Bank and the IMF who have publicly criticized their free market policies because they don’t actually help the development of poor nations. Reference: Gregory Palast, The Best Democracy Money Can Buy, Pluto Press, London, 2002, p. 48. In the two decades before the introduction of the Washington Consensus when government spending and welfare schemes were looked on with approval (1960-1980), the income per person grew by 73 percent in Latin America and 34 percent in Africa. In the following two decades as the Washington consensus was implemented incomes in Africa have declined by 23 percent and the Latin American economies have only grown by 6 percent. Reference: Paul Blustein, ‘IMF's 'Consensus' Policies Fraying’, Washington Post, 26 September, 2002, p. E01; Richard Lapper, ‘Piling on the Pressure’, Financial Times, 5 October, 2002, p. 1; Juan Forero, ‘Still Poor, Latin Americans Protest Push for Open Markets’, The New York Times, 19 July, 2002, p. A-1. In developing countries life expectancy has dropped. The gap between rich and poor has increased. Forty four percent of people in developing nations live in poverty and unemployment has doubled in the last decade. Reference: Frank Stilwell, ‘Economic Rationalism: Sound Foundations for Policy?’ in Stuart Rees, Gordon Rodley and Frank Stilwell (eds) Beyond the Market: Alternatives to Economic Rationalism, Leichhardt, NSW, Pluto Press, 1993, p. 35. Reference: Michel Chossudovsky, ‘The Global Creation of Third World Poverty’, Third World Resurgence, January, 1992, p. 13. Michel Chossudovsky, Professor of Economics at the University of Ottawa, outlined how World Bank and IMF policies have transformed low-income countries into open economic territories and ‘reserves’ of cheap labour and natural resources available to transnational companies and consumers in high-income nations. In the process, governments in low-income countries have handed over economic control of their countries to these organizations, which act on behalf of powerful financial and political interests in the USA, Japan and Europe. Having handed over this control, they are unable to generate the sort of local development that would improve the welfare of their own people. Reference: Gabriel Kolko, ‘Ravaging the Poor: IMF Indicted by Its Own Data’, Multinational Monitor, June, 1998, p20; Chris Adams, ‘Privatising Infrastructure in the South’, Focus on Trade, May, 2001. The IMF had always argued that although the poor suffered in the short term from the austerity measures imposed by IMF structural adjustment programs, they would ultimately benefit from the economic growth that these programs would achieve. Asian countries had been the economic growth success stories. Therefore the Asian crisis in 1997 opened the IMF to even more criticism. The IMF was unable to reverse the economic decline in countries like Thailand, Indonesia and South Korea. Structural adjustment is now carried out in the name of poverty reduction rather than economic growth. It achieves neither but the failure to achieve economic growth is much easier to measure. The policy prescriptions remain unaltered. Reference: IMF quoted in Gregory Palast, The Best Democracy Money Can Buy, Pluto Press, London, 2002, p. 50. Reference: Juan Forero, ‘Still Poor, Latin Americans Protest Push for Open Markets’, The New York Times, 19 July, 2002, p. A-1. A popular and political ground swell is building from the Andes to Argentina against the decade-old experiment with free-market capitalism. The reforms that have shrunk the state and opened markets to foreign competition, many believe, have enriched corrupt officials and faceless multinationals, and failed to better their lives. Reference: John Gray, False Dawn: The Delusions of Global Capitalism, London, Granta Books, 2002, pxx. By 2002 economists were also growing disillusioned with the Washington Consensus because of its failure to deliver on its promises: ‘The ‘Washington consensus’ has been effectively repudiated in Washington’. Reference: Quoted in Paul Blustein, ‘IMF's 'Consensus' Policies Fraying’, Washington Post, 26 September 2002, p. E01. In the early ‘90s, there was the sense that if you just opened your markets, and stabilized prices, and privatized industries, foreign investors would come to your door and you could enjoy rapid catch-up growth rates. And what has become painfully clear is that life is much more complicated than that. As the 21st century got underway people in Latin America, the heartland of the Washington Consensus, began voting for left-wing candidates willing to protect the national interest against the World Bank and IMF pro-market formulas. In Brazil, where incomes declined by 3 percent despite (or because of) adherence to IMF policy prescriptions, Luiz Inacio Lula Da Silva (pictured), a candidate from the Workers Party who had not even achieved 25% of the vote in three previous elections, was elected as president in 2002. Reference: Juan Forero, ‘Still Poor, Latin Americans Protest Push for Open Markets’, The New York Times, 19 July, 2002; Larry Rohter, ‘In Free-Market Slump, Brazil's Voters Look for Change’, The New York Times, 5 October, 2002; Juan Forero, ‘As Bolivians Vote, Populism Is on the Rise’, The New York Times, 30 June, 2002. In Venezuela, a leftist government led by Hugo Chavez, was elected in 1998 on an anti-corruption and anti-poverty platform. Chavez has been strongly opposed by the Venezuelan business community and organized labour but has managed to survive an attempted coup, a business strike led by oil industry management, US government opposition, and a referendum to remove him. In Bolivia, which had been among the earliest privatizes in Latin America in the 1980s, indigenous leader, Evo Morales, came into power with the second highest vote ever for election as president, after promising to nationalize industries. 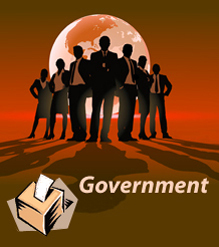 These governments can be expected to be put under unrelenting pressure by the international financial markets. 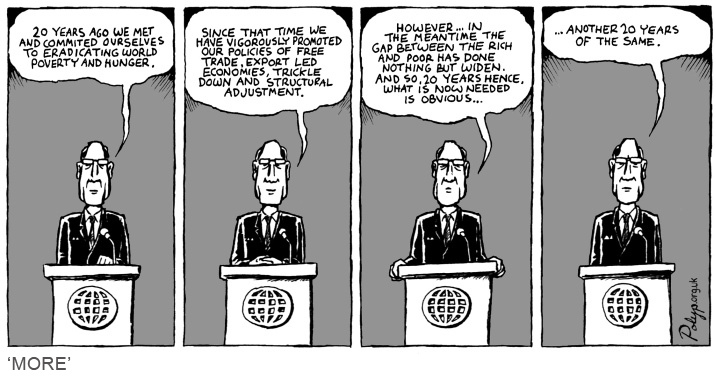 Reference: Larry Rohter, ‘Argentina's Economic Rally Defies Forecasts’, New York Times, 26 December, 2004. In Argentina, the economy has been making an unexpected recovery, growing by 8 percent per year, attracting investors back, and lowering unemployment and poverty. And this has been achieved, not by following IMF prescriptions but ‘at least in part by ignoring or even defying economic and political orthodoxy’. Rather than ‘tighten its belt’ as required by the IMF, it has sought to stimulate domestic consumption. And it has used government money, raised in part from levies on exports and financial transactions, to help the local economy rather than to pay off the banks and creditors. Whilst European investors avoid Argentina, investors from other Latin American countries, and from Asia, have taken advantage of the opportunities, as have expatriate Argentines. With more money coming in that leaving, Argentina is less beholden to the IMF. How long it can hold out against the IMF is an open question.